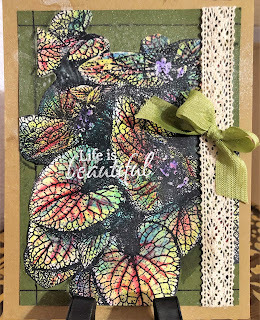 I sprayed Luscious Lawn Shimmering Bliss over the leaves stencil. After heat setting it I sprayed Mindaro Shimmering Bliss over the circles stencil. 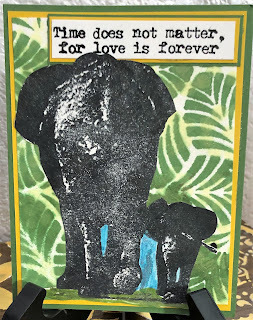 Then stamped the elephants on white card using my stamp positioner tool, inking it three times. It was fussy cut and mounted onto the leaves panel. I used a Nuvo Glitter Marker in green to color the grass. The sentiment was embossed and heat set before matting and adhering to the top of the card. Please remember to look at the two clearance sale items - mounted and unmounted on cling foam. Do you want to save 10% on your order? Then please use my code TJ10Judy when you check out. Have a terrific day - and get inky! I stamped both images on white card and the spritzed with vagarious colors of Technique Junkies Shimmering Bliss spray. 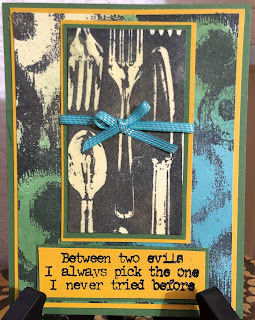 I only stamped a small section of the Flatware stamp. 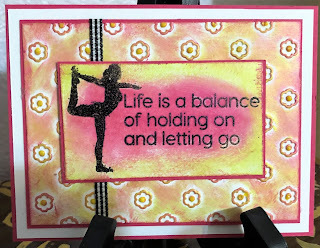 I stamped the sentiment on the dark yellow card stock and heat embossed the sentiment. and Own Kind of Beautiful. I stamped the wood panel on white card stock and used both beige and blue inks to sponge color on the panel. I die cut leaves and used a fine tip pen to go over the leaf lines. Then I used a Nuvo Glitter Gloss pen to add shimmer to the leaves. The verse was stamped and heat embossed. The heart was colored in with a rose dye based marker. First I stamped the French Text on white card stock. Then I used a pale pink vellum and stamped Collage Eiffel with black Memento ink. I heat set it to dry. Then on the back of the image I sponged some green ink over the the tree branches. I trimmed the image. I then put one strip of ATG adhesive at the top of this image. I made sure to put it on the dark black frame so it wouldn't show. 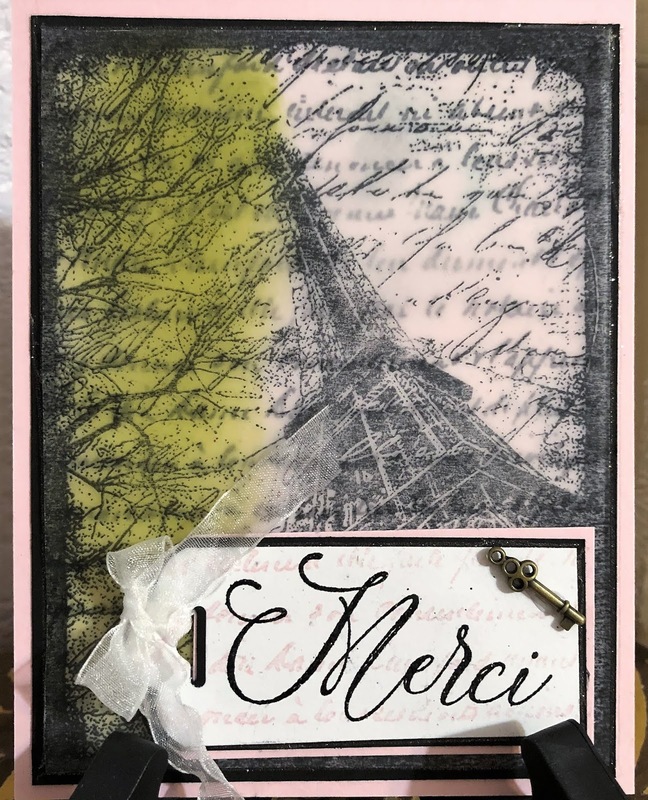 Then I carefully placed the image on the stamped French Text so that the text would show up between the writing on Collage Eiffel. Merci was stamped on a punched tag and heat embossed. Then i used pale pink ink and stamped the French Text over it. I used a Nuvo Glitter Gloss Pen and painted the fluid over the tag to add shimmer. 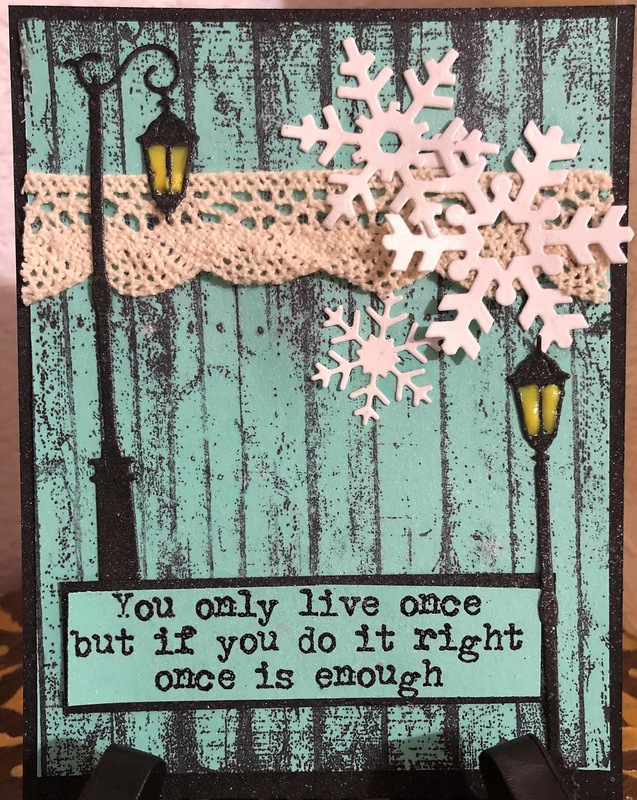 I used 2 Technique Junkies Stamps to create this card: Weathered Wall and Mae West Sentiments. The first thing you will notice is that the orientation of the wood is portrait and not landscape. But I wanted it to be portrait. So I stamped the image on my blue card stock and of course it didn't reach the top. So I turned the card stock in my stamp positioner and stamped again. Then I put a piece of lace over the seam and it appears to be one stamp in the portrait orientation. I added some die cut snowflakes and die cut old-fashioned street lamps. I filled in the lights with yellow Nuvo drops. The Mae West sentiment was stamped and heat embossed. My last step after assembling the card was to spritz it all with Dazzle Shimmering Bliss Topper. Gorgeous shimmer! 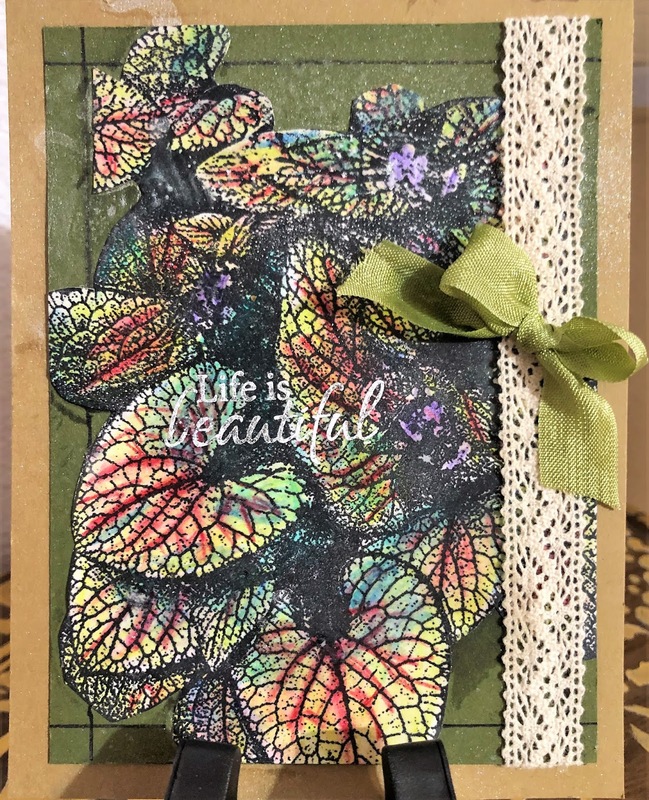 I created this card with two Technique Junkies Stamps - Caladiums and Life is beautiful. I used Watercolor pencils to color in the leaves, using one color at a time, then heat setting the paper so the colors would not be muddied. Then I used the edge of an acrylic block (because I am now in Florida and I couldn't find my ruler!) to draw the black lines and 1/4 inch from the edge. I trimmed and cut away part of the stamped image to add interest and texture to the focal image. I applied Distress Glaze over the top of the leaves before I sprayed Technique Junkies Simmering Bliss Dazzle Topper spray. Lace and ribbon finish the card. There are two clearance areas on the Technique Junkies web store - one is for cling mounted clearance and the other is for unmounted clearance (just the rubber!). 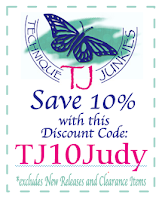 You can take a 10% discount off of your order when you use the discount code TJ10Judy. I hope your day is just great, and you have time to get inky! 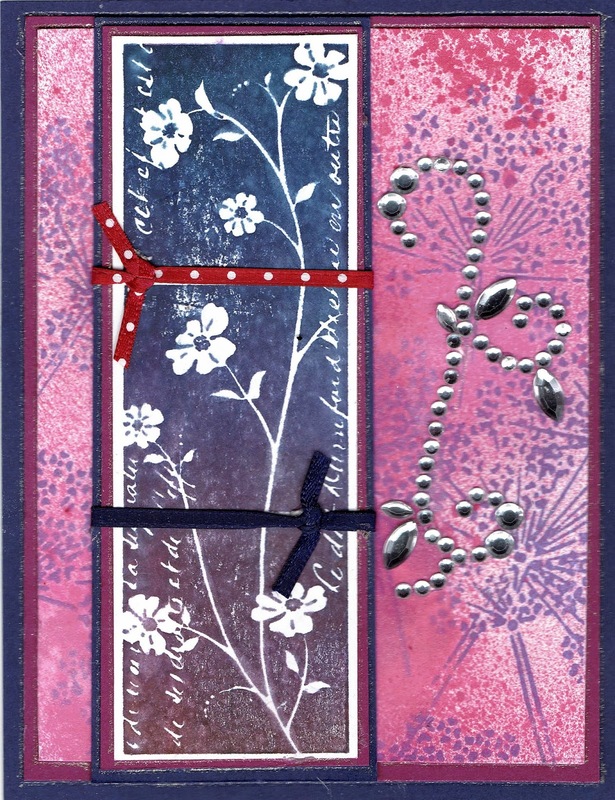 I used Technique Junkies Three Flower Collage stamp as the focal image for this card. I brayered from a Kaliedacolor ink pad -- do you remember those? 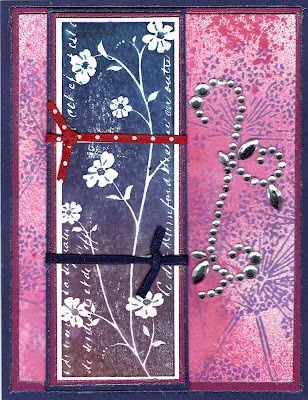 The background was stamped with Technique Junkies Stamps Queen Anne's Lace. Then I sprayed over the stamped image in purple with Technique Junkies Shimmering Bliss sprays. I tied two ribbons around the panel to match the colors of card stock I used for matting and for the base card. Some bling brings sparkle! Then you can get a 10% discount by using the the discount code TJ10Judy. I found this information about the Eiffel Tower on the internet and thought I would share it with you. These are not my own words. The Eiffel Tower, as the name might suggest, was designed and built by Gustave Eiffel's engineering company, Compagnie des Établissements Eiffel. Contrary to popular belief, however, Eiffel himself has very little to do with the tower's design and actual construction. The tower was designed by two of Eiffel's senior engineers, Maurice Koechlin and Émile Nouguier. The tower's design came about after a discussion about a suitable centerpiece for the 1889 Paris Exposition. It was specifically intended as the grand entrance to the Exposition and was not meant to be a permanent feature of the Parisian skyline. After its official inauguration in March of 1889, the tower was supposed to stand for 20 years and be dismantled in 1909. This was the total time limit awarded to Eiffel for his permit to build it. Once ownership reverted to the City of Paris the original plan was to dismantle it. In fact, part of the original competition rules was for the winning structure to be easily dismantled. But as it provided a great radio antenna it was allowed to remain standing after the permit's expiration. So groups of tourists travel to see the Eiffel Tower many years after it was built. I used Technique Junkies Shimmering Bliss sprays to color the scene. 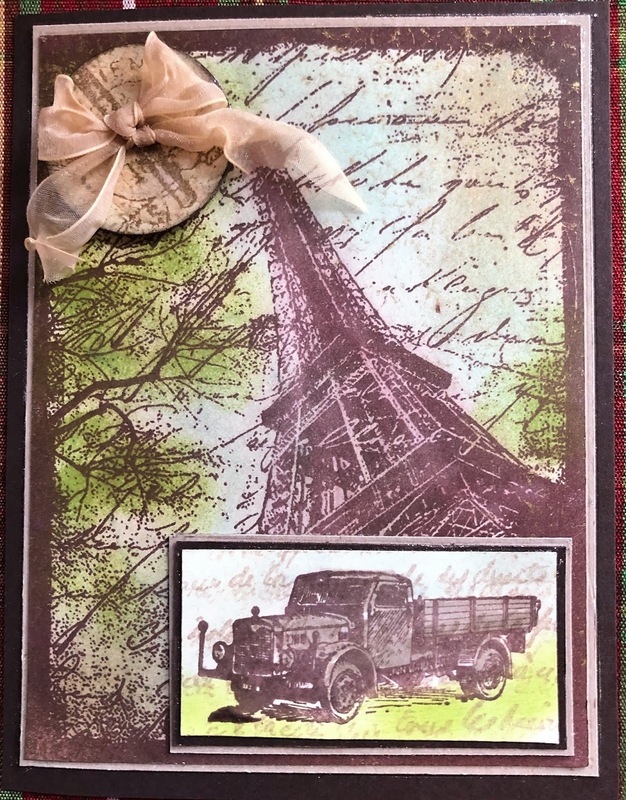 The Technique Junkies Collage Eiffel stamp is so lovely. The truck comes from the Technique Junkies Stamps Enjoy the Ride. I used a small portion of Technique Junkies Key Script to stamp the die cut circle at the top left. 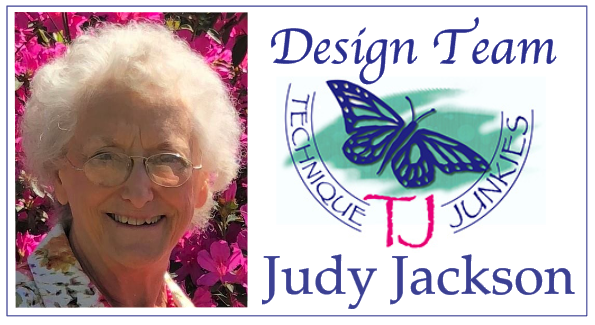 Please remember using the discount code TJ10Judy will discount your entire order amount by 10%. I used Technique Junkies stamps Life is a Balance stamp to create this card. 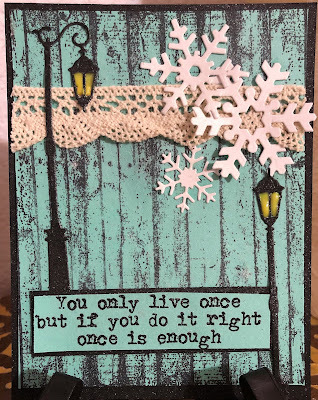 I stamped it in a pigment ink and heat embossed with a glittery black embossing powder. I used an embossing folder to create the background. Both the background and the focal image panel were highlighted Art Nuvo mousse in pink and a yellow green. I first stamped Technique Junkies Stamps Big Flourish twice. Once in brown and once in black. Then I matted the focal image in black and the base card stock is a brown. The verse In My Prayers is also a Technique Junkies Stamp. It is matted as well. 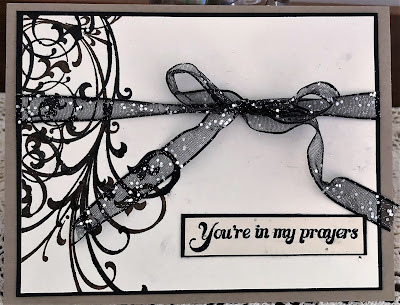 A glittery black ribbon and boy finish this simple card. Did you know you can get an extra 10% off your order by using the coupon code TJ10Judy? 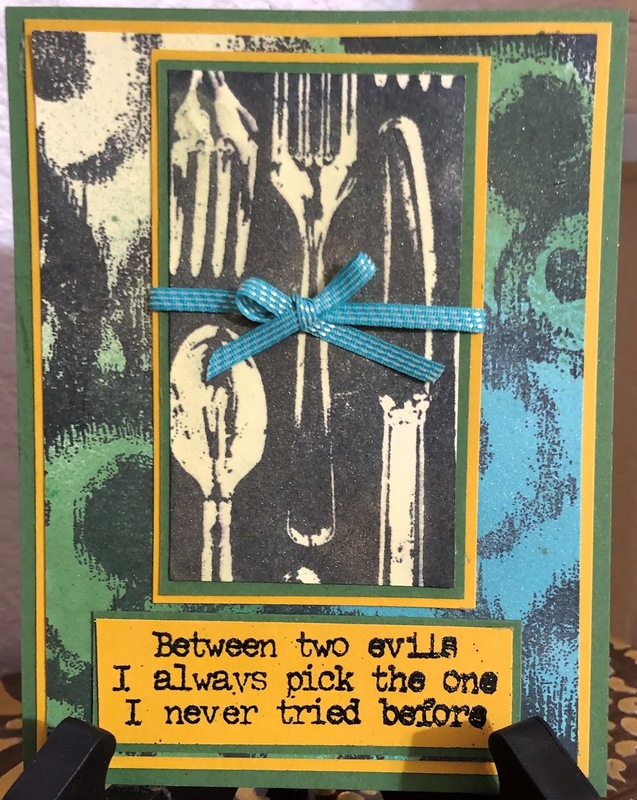 I saw a card similar to this one that I created somewhere on Pinterest. While it is similar this one is still original with me! I used Technique Junkies Shimmering Bliss sprays on every element of this card. 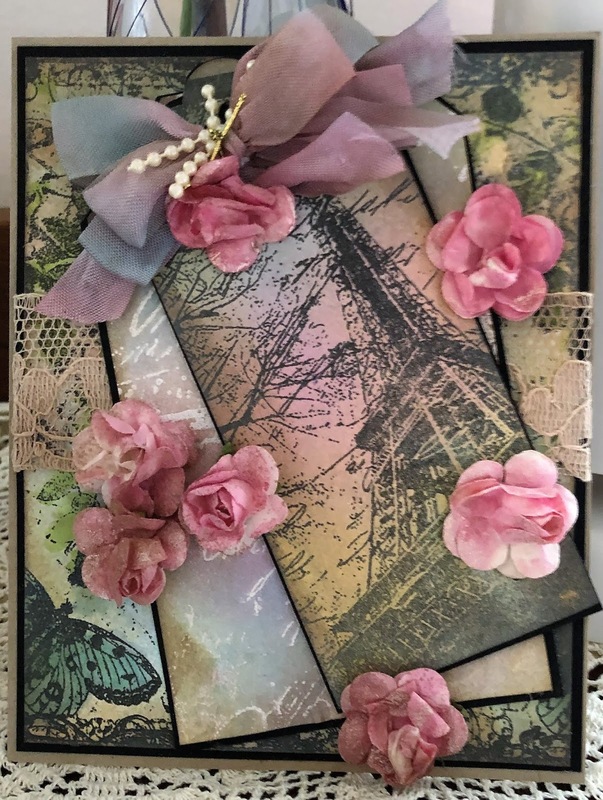 The base card panel was stamped with Technique Junkies Dragonfly Collage. 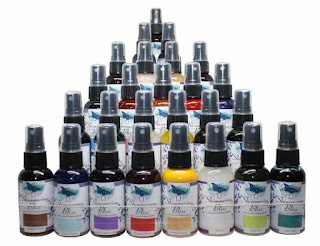 Then I spray it with 3 colors of Shimmering bliss sprays. One of the things I did was to create a softer version of a few of the more intense colors. I put some water into a small spritzer bottles, and added some of the Thulian Pink and Luscious Lawn sprays. They still shimmered! The bottom tag was tamped with Technique Junkies Key Script. I heat embossed the image with white embossing powder and then sprayed with Shimmering Bliss sprays. 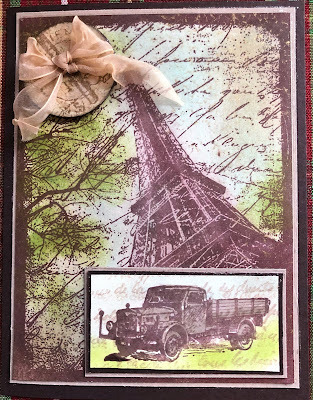 The top tag was stamped with Collage Eiffel Collage. Then it was sprayed with Shimmering Bliss sprays. Each of the layers were matted with black paper to make each layer stand out a bit more. The paper roses from my stash were sprayed with the lighter Shimmering Bliss of various . The white ribbon was sprayed random spritzes of color and then heat set to dry. I then assembled it all. The top tag is popped with foam dots. 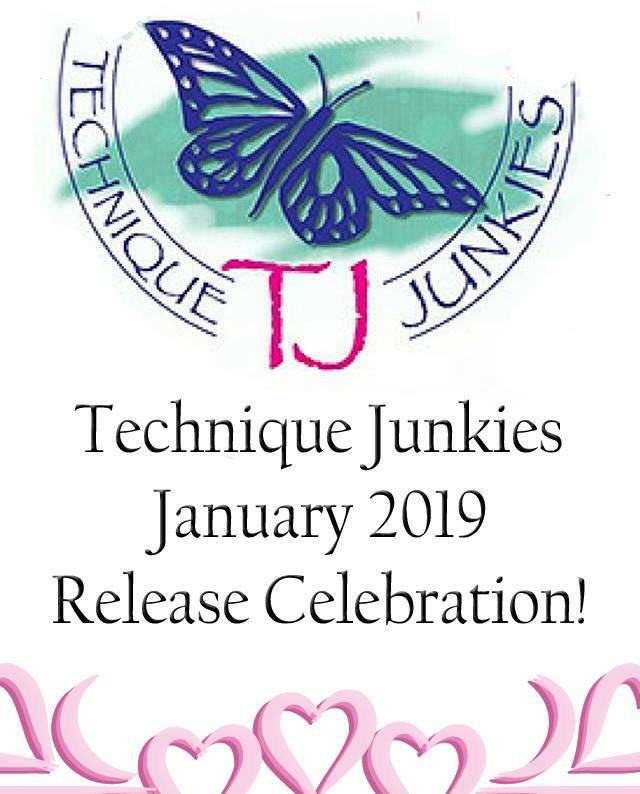 Remember there is a 15% discount on the new release for Technique Junkies Stamps through January 8. And for everything else you buy, use my personal code TJ10Judy to save 10%! 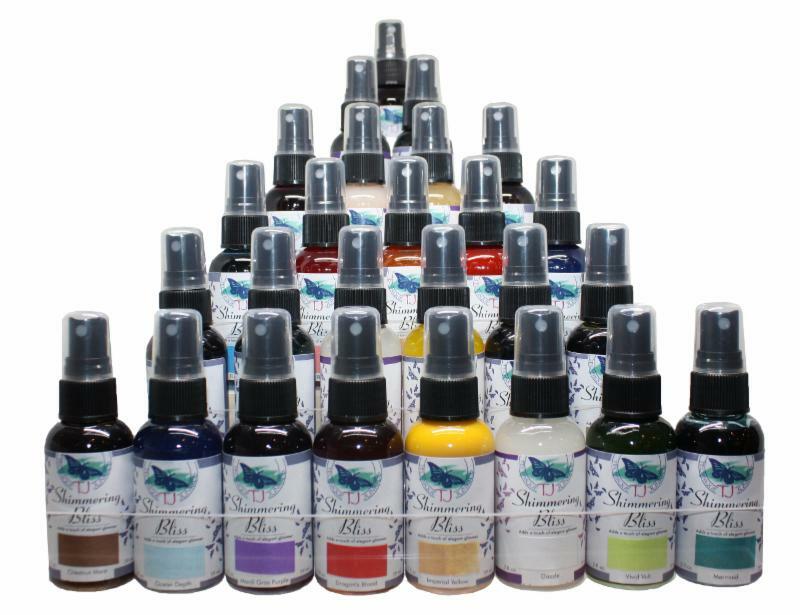 The New Year has begun and and it is time get inky!! 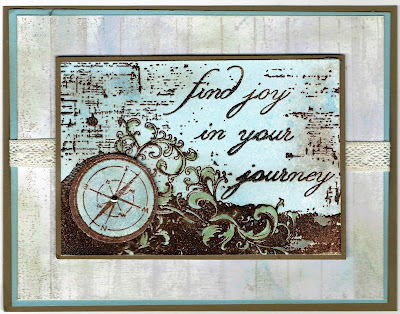 I stamped the wood panel in a light brown ink and then sponged both blue and a light brown ink over all to distress it. The focal panel was stamped in dark brown Versafine ink and then heat embossed with detail clear embossing powder. I used Technique Junkies Ocean Depth Shimmering Bliss to add blue to the panel. Then distressed the panel by sponging brown ink randomly. I stamped the area with the compass, spritzed with Technique Junkies Ocean Depth Shimmering Bliss spray . Then I used a circle die to cut it out and popped it up with foam dimensionals. I added some green with a marker to some of the flourishes. Please remember that all of the new release stamps are 15% and the sale price will automatically show up through January 8. 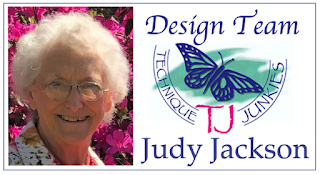 Please remember that you can get 10% off your purchase (but not on the newly released stamps) by using the coupon code TJ10Judy! I hope 2019 brings you Joy in Your Journey and that you have lots of time to get inky!! A New Year and A New Stamp Release -- Yahoo!!! Today is exciting! There has not been a Technique Junkies Stamps Release since November 1, 2018! And today is not only the start of a New Year - 2019 - it is also RELEASE DAY!! Yahoo. 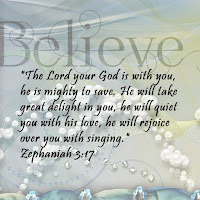 Be sure you start looking at the various blogs start here at the very beginning. And the Beginning is of course the Technique Junkies Blog! There you will find a list of all of the blogs of the Design Team. Please be sure to go to every blog, and please leave some "love" in the way of comments. As always there will be an automatic 15% off all of the new release stamps through January 8, 2019. Please make sure you go and have a look! The stamps are so nice! I have two new cards for you to enjoy today. 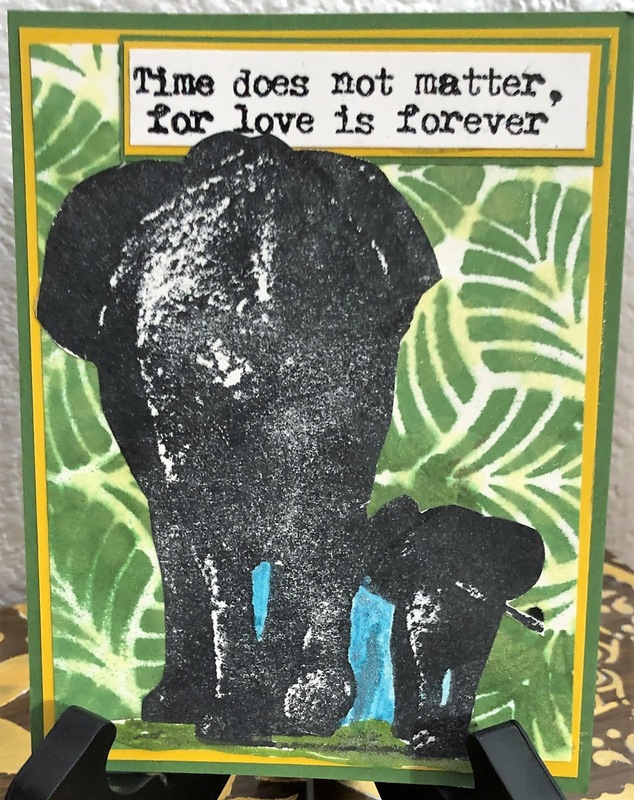 This first card was stamped with permanent black ink and then sprayed with Technique Junkies Shimmering Bliss Sprays. I used Ocean Depth and Luscious Lawn. 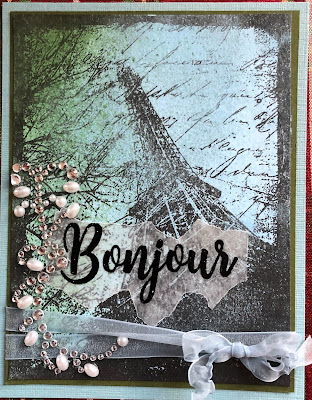 I used Technique Junkies Stamps Collage Eiffel and Technique Junkies Stamps French Sentiments - Set of 4. The sentiment was stamped with Versafine pigment ink and then heat embossed with detail black embossing powder on vellum. It is attached with Xyron adhesive. 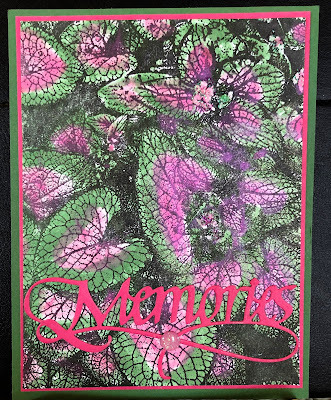 My second card uses Technique Junkies Stamps Caladiums. These plants are so colorful! Who wouldn't want them in their garden! I used a die cut word for the sentiment on the front. 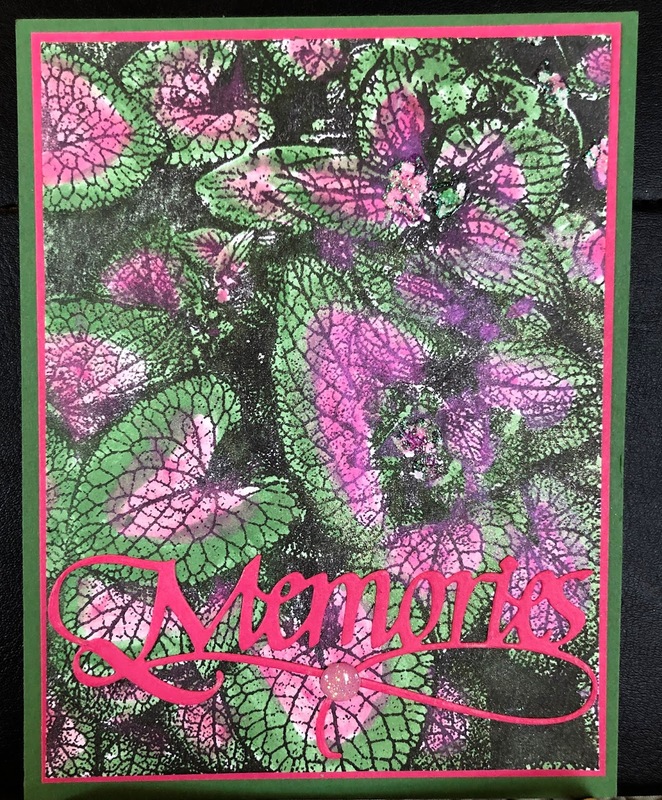 I used Art Anthology Nuvo Mousse Pink Flambee to water color the pink parts of the leaves. I used Technique Junkies Shimmering Bliss Luscious Lawn . 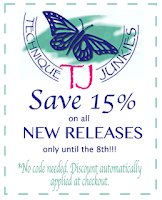 Don't forget that all of the newly released Technique Junkies stamps are on sale with an automatic discount of 15%! And there are all kinds of cling mounted stamps on sale! Check them out! There is a second group which are unmounted on sale as well. Don't forget you can get 10% off your purchase (but not on the newly released stamps) by using the coupon code TJ10Judy! Have a wonderful New Year's Day! I hope the new year brings you lots of joyful experiences, lots of learning experiences, lots of love in many ways, and lots of time to get inky! !